WASHINGTON, DC, January 28, 2011 (ENS) – HOVENSA LLC, owner of the second largest petroleum refinery in the United States, has agreed to pay a $5.375 million civil penalty and spend more than $700 million in new pollution controls to resolve Clean Air Act violations at its St. Croix, U.S. Virgin Islands, refinery. The refinery is a joint venture between Hess Corporation and Petroleos de Venezuela that supplies heating oil and gasoline to the U.S. Gulf Coast and the Eastern Seaboard with crude oil mainly sourced from Venezuela. The settlement requires new and upgraded pollution controls, more stringent emission limits and aggressive monitoring, leak-detection and repair practices to reduce emissions from refinery equipment and process units, the Department of Justice and Environmental Protection Agency announced Wednesday. 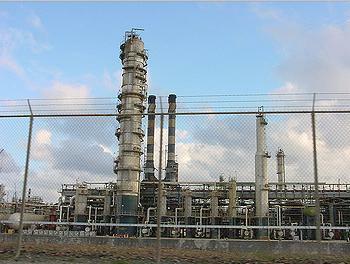 “This important settlement with the second largest refinery in the United States will result in significant improvements to human health and the environment of the U.S. Virgin Islands,” said Ignacia Moreno, assistant attorney general for the Environment and Natural Resources Division of the Department of Justice. The government’s complaint alleged that the company made modifications to its refinery that increased emissions without first obtaining pre-construction permits and installing required pollution control equipment as required by the Clean Air Act. Once fully implemented, the pollution controls required by the settlement are estimated to reduce emissions of nitrogen oxides (NOx) by more than 5,000 tons per year and sulfur dioxide (SO2) by nearly 3,500 tons per year. High concentrations of SO2 and NOx, two key pollutants emitted from refineries, can have adverse impacts on human health, and are significant contributors to acid rain, smog and haze. The settlement will result in additional reductions of volatile organic compounds, particulate matter, carbon monoxide and other pollutants that affect air quality. Additional pollution-reducing projects at the refinery’s coking unit under the settlement will reduce greenhouse gas emissions by over 6,100 tons per year. The government of the U.S. Virgin Islands has joined in the settlement and will receive a portion of the civil penalty. The company will set aside an additional $4.875 million for projects to benefit the environment of the U.S. Virgin Islands. The projects will be identified jointly by the U.S. Virgin Islands government and HOVENSA, in consultation with the U.S. EPA. With the capacity to refine more than 525,000 barrels of crude oil per day, the HOVENSA refinery has been classed one of the 10 largest refineries in the world. But on Wednesday the company announced plans to shut down several processing units on the west side of the refinery, reducing the refinery’s crude oil distillation capacity to 350,000 barrels per day. The consent decree, lodged in the U.S. District Court of the Virgin Islands, is subject to a 30-day public comment period and court approval.